Pine Bluff, Ark. 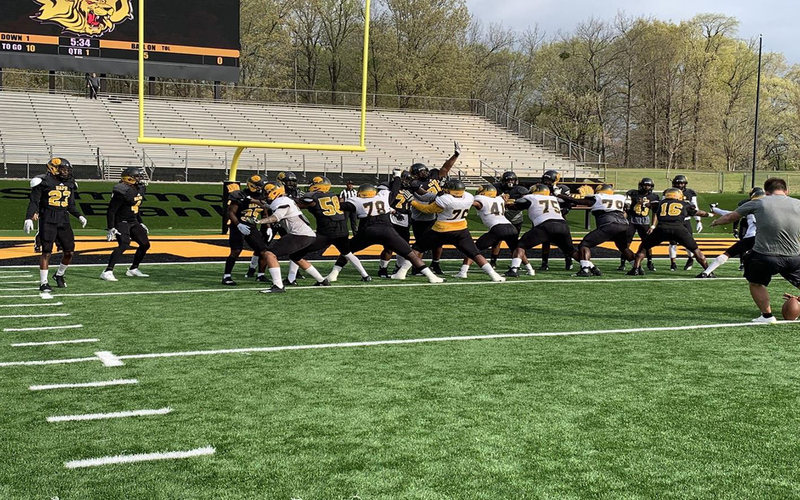 – The University of Arkansas at Pine Bluff Coach Cedric Thomas got what he was looking for out of his team during Friday night’s Black and Gold Spring Football game. Thomas stressed execution going into the Golden Lions’ final practice of the offseason, and for the most part, UAPB delivered on both sides of the ball in front of several hundred fans at Simmons Bank Field. The Black team, which was essentially the Golden Lions’ defense, held off a late charge from the Gold to win 33-28, but that was somewhat of an afterthought. Thomas got a chance to see just how much progress his team has made since its 2018 season ended nearly five months ago. UAPB staggered to a 2-9 finish, but the Golden Lions finished the year on a high note by beating Texas Southern 15-10 on the road in their season finale. UAPB carried the momentum generated from that victory over into the spring, and it got the second-year coach excited about where his team stands. The Gold team, consisting of the team’s offense, had several big plays in the scrimmage, particularly from their top two signal callers. Freshman Skyler Perry threw 37- and 31-yard touchdown passes to sophomore wide receiver Tyrin Ralph while junior Shannon Patrick, who played in just two games after suffering a season-ending hand injury, found junior Missouri transfer Harry Ballard for a 31-yard score. “It’s a blessing to have two really good quarterbacks,” Thomas said. “This is Shannon’s second go-round in the spring, even though he didn’t play many games during the season. And then, this is Skyler’s first spring, but the kid started 8-9 games last year. The Golden Lions won’t return to the field until fall workouts in a little over three months, but for Thomas, the process never stops.